The bounty produced by the Library Garden this fall captivated many visitors. We Master Gardeners of Northern Virginia (MGNV) loved sharing the beauty and abundance of Nature’s gifts, while also having the opportunity to answer lots of questions elicited by the great variety of seeds, berries, fruits and the one “faux-nut” displayed in our Glencarlyn Library Teaching/Demonstration garden. In this article we hope to capture the beauty and variety with photos, while also giving you descriptions of the trees and plants that produced them. Red Buckeye Faux-Nut cracked wide open. Faux-Nuts – Red Buckeye: Sporting showy tubular red flowers that attract hummingbirds and bees in the spring, this native large shrub or small tree (Aesculus pavia) grows lovely brown rounded 1 to 2-inch fruit capsules in the fall, each of which holds a large brown seed that looks and feels like a nut. Though the seed/faux-nut is poisonous to most wildlife, it is shiny with one light patch that looks a bit like a “buck’s eye” and is thought to bring good luck to one who carries it in his or her pocket. Growing to 8-10 feet, it can be planted in part-shade in any kind of soil. In the Library Garden it grows on the 3rd Street side, has been very undemanding, and provides great beauty in the spring and high interest in the fall. 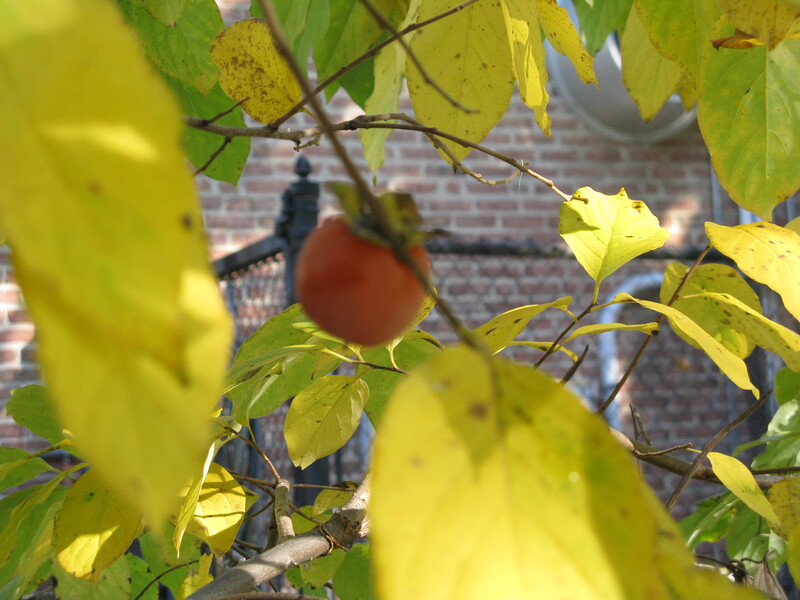 First Fruits – Persimmons: Some years ago a gorgeous native Persimmon tree (Diospyrus americana) fruited every fall at the Library Garden. 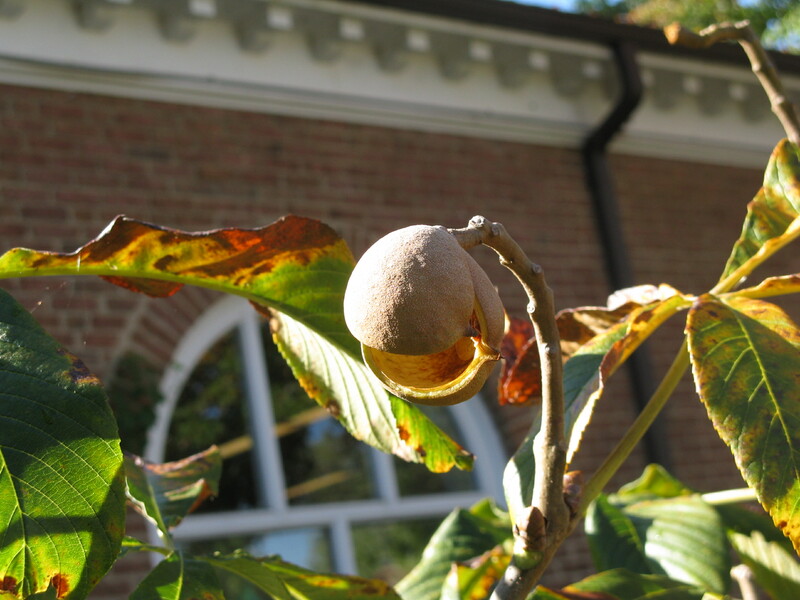 It’s Latin name, Diospyros literally translates to “Fruit of the Gods.” When it died, we gardeners were very sad. It’s delicious fruit provided food for people, birds and insects, beautiful black seeds to show the children, and a few new little trees. Unbeknownst to us, our old persimmon tree had dropped some of its seeds into the ground before it died. Over the next three years, three of these seeds turned into small trees. One has been allowed to grow tall and this year delighted us with its first two persimmons. They were so pretty, we didn’t try to pick and taste, but maybe next year! It’s the Berries – American Beautyberry: As the Better Homes and Gardens internet site quips, “Beautyberry is one shrub that’s really earned its common name.” Callicarpa americana is a native shrub growing just inside the archway, on the left when you enter from the Third Street side of the Library Garden. It has pretty pink blossoms in summer, but doesn’t really shine until fall when spectacular magenta berries cluster at intervals all along the branches. Birds, such as cardinals, mockingbirds, catbirds and finches, eat the berries later than other foods so the magenta berries provide wonderful fall color that some years lasts through November. Since flowering and fruiting occur on new growth, Callicarpa is cut back to about 2-3 feet each spring. Plant in light shade in any kind of soil that gets some moisture. 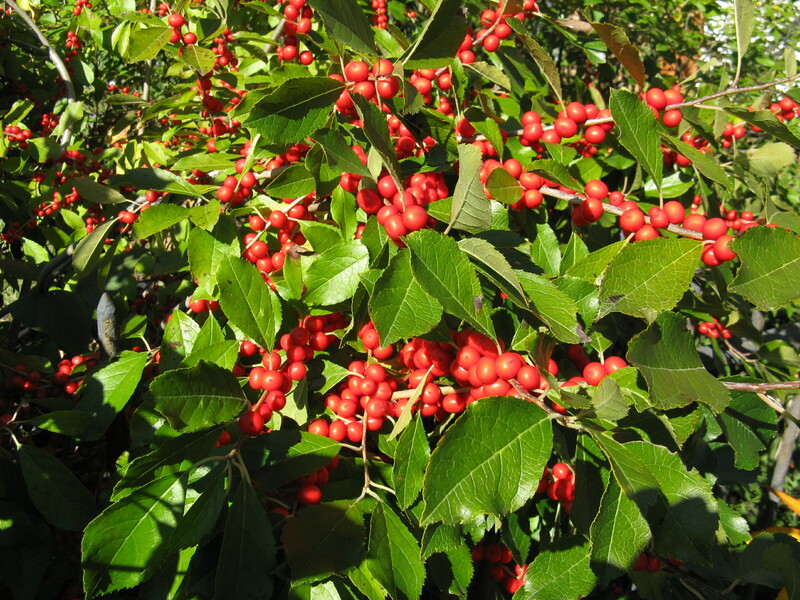 Winterberry Holly: The large round red berries of the native deciduous shrub, Winterberry holly ‘Red Sprite’ (Ilex verticillata), stand out like beacons of warmth as the temperatures drop in late autumn and early winter. Located just inside the cemetery fence, the abundant berries remain and are showy until spring when freezing and thawing softens them enough so that returning robins, catbirds and mockingbirds can enjoy a spring feast. Sometimes you’ll notice the birds getting a bit “tipsy” if the berries have begun to ferment! Because hollies are dioecious, you have to buy both male and female plants to get the pollination needed to produce berries. ‘Red Sprite’ will only fruit well if you plant the male ‘Jim Dandy’ nearby. One ‘Jim Dandy’ winterberry can pollinate many female ‘Red Sprites,’ so it makes sense to plant several females in front of the unremarkable but much needed male. Winterberries can grow in full sun or part shade. They like acid soil and a wet spot in the garden. High on any gardener’s plant list if one is lucky enough to have the right combination of factors, ‘Red Sprite’ is our garden’s favorite fall and winter bright spot, bringing a smile to the faces of visitors as they enter the Library and the Holiday season. Purple Hyacinth Bean: Dolichos lablab is a fast growing, gorgeous, pink and purple ornamental vine growing along the fence in front of the parking lot at the Library. 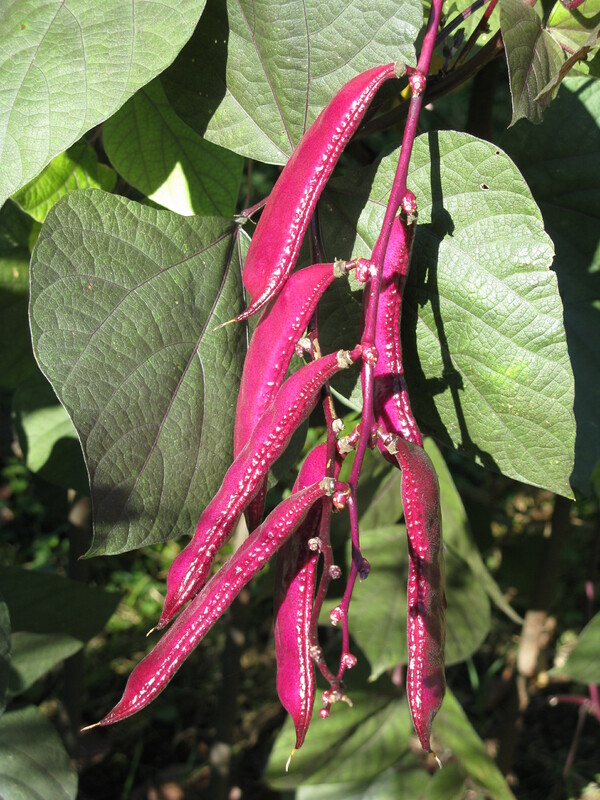 On the years that the Library Rabbit does not nip the stalk in half just as the vine starts producing, this plant sports deep pink flowers, followed by 3 to 4-inch long deep aubergine bean pods all along the stalk from early summer until frost. As if that were not enough to warrant inclusion in this very short list of great seed-producing plants, the mature seed pods (when they turn brown and begin to split) contain dried beans that are gorgeous, like black jewelry with a bright white mid- section! What other plant is beautiful in flower, pod and seed? The dried seeds of this annual ornamental vine can be kept over the winter, notched or soaked overnight to soften the hard outer shell, and planted outdoors once the soil has warmed, but need a sunny spot and a strong fence, arbor, or trellis to climb on. Sweet Gum Seed Pod, still green. 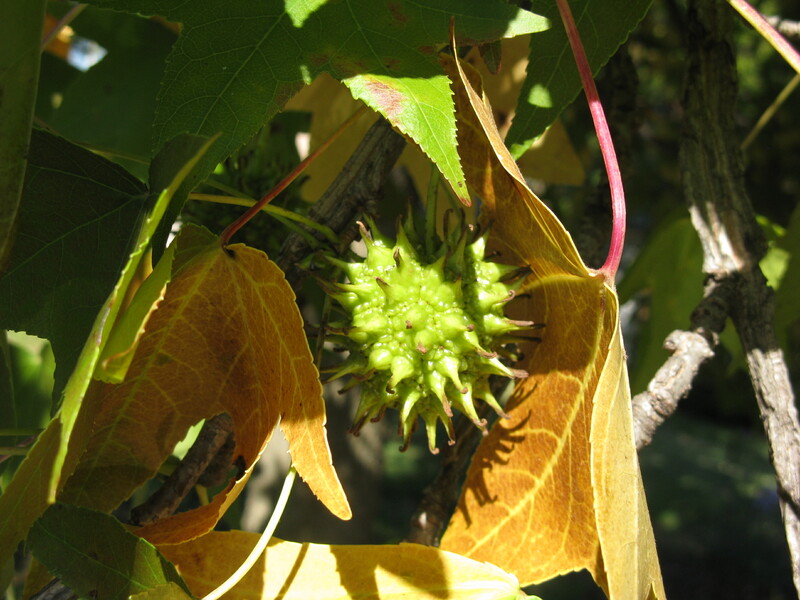 Sweet Gum Seed-Pods: Still important commercially in the Southeastern United States, this native hardwood tree, Liquidambar styraciflua, has a long history in our country. It’s Latin name comes from its description by Spanish naturalist Francisco Hernάndez in 1651 as, “a large tree producing a fragrant gum resembling liquid amber.” [Wikipedia reference] It’s leaves, usually 5-pointed, star-shaped and glossy, turn deep red in fall. The seed-pods, initially green, turn brown as they ripen and look like 1-inch round thorny stickers. The internet writer/forager Green Deane of eattheweeds.com described them as, “the sand spur of the forest. …. The vicious seed pods have impaled many a forager and have done much to ruin the Sweet Gum’s reputation.” On the other hand, many a crafter has been grateful for these spiny pods. When spray painted silver, gold or red and frosted with glitter, they make lovely tree or table holiday decorations! The Glencarlyn Library Community Garden is one of the five Master Gardeners of Northern Virginia and Virginia Cooperative Extension Demonstration Gardens. Open to the public during daytime hours, these gardens grow and show many of the plants, shrubs and trees available to homeowners in Northern Virginia as well as providing a place of beauty and respite for those wanting a touch of the natural world in the midst of our urban setting. Located in Arlington, VA just south of Route 50 off Carlin Springs Road at the corner of S. Third and South Lexington Streets, this is a place to come and savor the gifts of a garden in the midst of our hurried world. 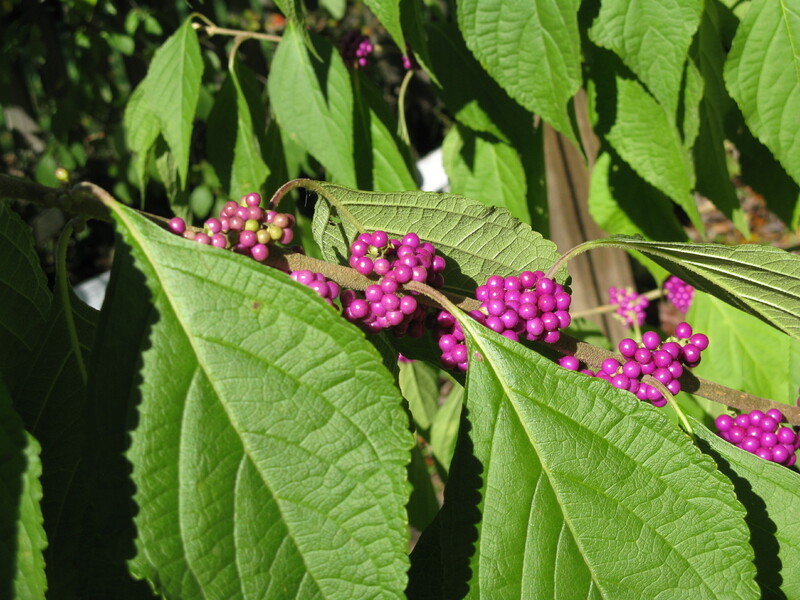 This entry was posted in Glencarlyn Library Community Garden, MG in the Garden and tagged "Fruit of the Gods", 'Jim Dandy' winterberry, 'Red Sprite', Aesculus pavia, Alexandria, American Beautyberry, Arlington, Callicarpa, Callicarpa japonica, callicarpenal, carllicarpa americana, Diospyrus americana, Dolichos lablab, fall gardening, Francisco Hernandez, gardening, Glencarlyn Library Garden, hollies, Ilex verticillata, Liquidambar styraciflua, Master Gardeners, MGs, mosquito repellent, persimmons, Purple Hyacinth Bean, Red Buckeye, Sweet Gum Seed-Pods, Winterberry Holly. Bookmark the permalink.